The customer must state when booking with a restaurant that they will be using a Dine in Dublin Voucher for their meal. The Dine in Dublin Voucher is only valid at participating restaurants. Please see DineinDublin.ie/vouchers for the most up-to-date version of these restaurants. Once a customer has chosen and is dining in a restaurant they are the sole responsibility of that restaurant and not the responsibility of the DublinTown (BID) Company. The vouchers are not tied to any promotions or value meals at the discretion of the restaurant. The vouchers are redeemable at any time / date within the assigned validity dates. If the cost of a meal is in excess of the value of the voucher then the customer must pay the excess by cash or card accepted by the restaurant. If the cost of a meal is less than the value of the voucher then the restaurant in which the customer is dining must give the customer the change / excess in the form of a voucher for the restaurant in which the customer is dining. 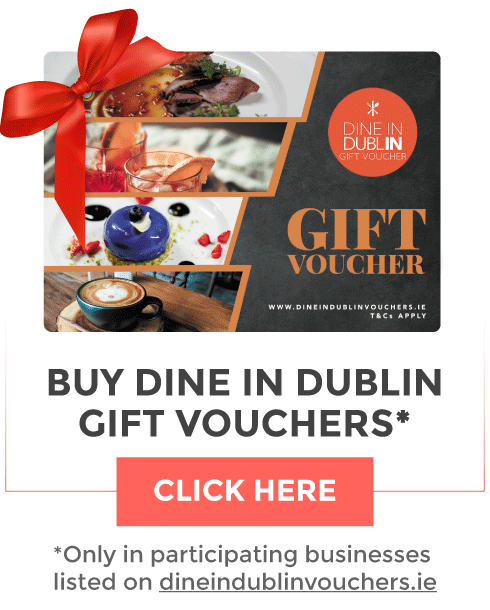 The Dine in Dublin Voucher cannot be used in conjunction with any other voucher, promotion or deal at the discretion of the restaurant in which the customer is dining. If a voucher is lost / stolen this is the sole liability of the customer. No voucher will be replaced and no refund will be issued. If a voucher is not redeemed within the validity period then it will become obsolete and no refund will be issued. A restaurant has the right to refuse to accept a voucher if a customer is trying to redeem it outside of the validity dates. A restaurant cannot assign the voucher to a specific menu / meal deal. It is solely up to the consumer to ensure that the voucher is redeemed within the validity period.